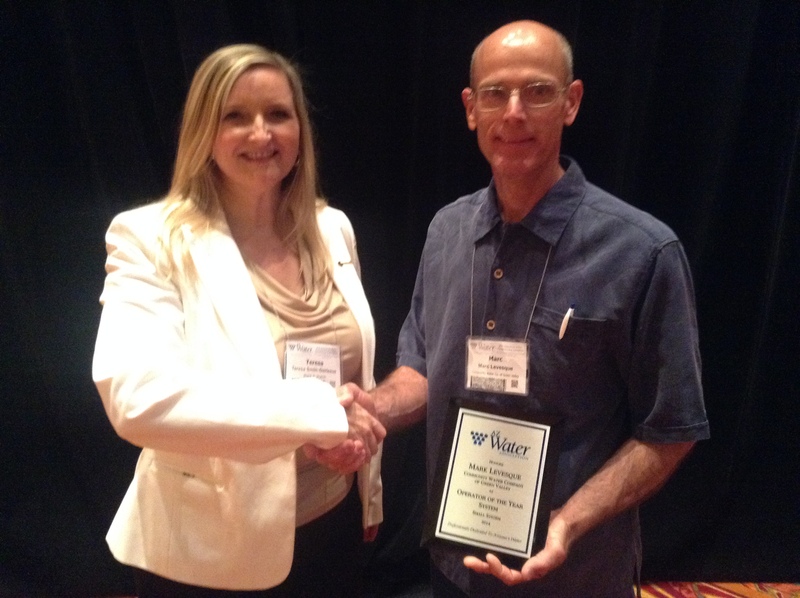 Green Valley, Arizona – Community Water Company of Green Valley is pleased to announce that on May 7, 2014, Marc Levesque, a 28-year employee and resident of the Town of Sahuarita, was recognized as the AZWater 2014 “Small System Operator of the Year” at its annual conference in Glendale, Arizona. This award recognizes excellence in the field of water distribution and treatment systems; demonstrating innovation, service to the community, conservation and participation in the water industry. Marc is a lifetime member of AZWater Association and holds certificates in both water distribution and water treatment. “I believe Marc is a true water professional and is very deserving of this award.” said Alan Forrest, Director of Tucson Water Department, who worked with Marc from 1995 until the year 2000, when he was President of Community Water Company of Green Valley. “As one of my mentors, Marc instilled confidence and energy in everything he taught me. Marc was a big part of my development as an operator not only in work ethics and standards, but in my social and personal interaction skills in the work environment.” said Jesse Mailloux, Operator IV, Tubac, EPCOR Water Company. “The AZWater Association awards program provides an opportunity to showcase individuals for their work in the industry. The Town reached out to local water utilities to maintain ongoing coordination and facilitate coordinated response efforts. Marc has been instrumental in that effort and has worked with the Town through training and coordination.” said Sheila Bowen, Public Works Director, Town of Sahuarita. The AZ Water is a nonprofit educational organization founded in 1928 with a membership of 2,700 water/wastewater professionals dedicated to preserving and enhancing Arizona’s water environment. Community Water Company of Green Valley is a nonprofit corporation with members, serving the Green Valley Sahuarita area since 1977. Marc was joined at the recognition ceremony in Glendale with his wife Laurie Levesque.